Wednesday was the graduation of my oldest pupils. Maite, the teacher that I share these classes with told me that I had to go to the ceremony because apparently the kids had something for me. I figured, why not? After my classes on Wednesday, I rushed home, quickly scarfed down some lunch, showered, got dressed up, and then caught the train taking me back to Tres Cantos an hour away. I thought the ceremony might have been a bit boring, but it was actually a lot of fun. There were video presentations with pictures of all the kids from all the different classes. Then there were students doing performances, like singing, playing piano, and everyone’s favorite, the dancing which everyone had told me was going to be amazing and it really was. Once they had gone through most of the classes, it finally arrived to the classes that I had taught. Each class had given out premios (awards) to all the teachers. Even though Maite had told me I was getting something I never expected to get an award. Miguel, one of my best students who speaks English like a true American (honest!) caught me off guard when he started to present the award and then said, “this one goes out to a ‘yankee…’” (saying ‘yankee’ doesn’t sound as strange in Spanish as it does in English. That’s just what they call anyone from the Good ‘Ole United States). That’s when I knew that I got an award. I was so stoked! How cool! Then Maite made me stand and wave to everyone. It was a great feeling, honest. Plus, I got the award for “El profe más ‘cool’” (the coolest teacher). Can’t go wrong with that! This is Miguel, the kid that gave me the presentation. You wouldn’t believe his English, it’s perfect American. Now I understand why people like being teachers. I got to see the rewards of teaching. Even though I only taught these kids one day a week this year, I still felt some sort of satisfaction or pride. I’m really not sure how to describe it, but it’s such a cool feeling getting to see these kids move on with their lives and do something. Watching the picture presentations and listening to the awards and things, it took me back to my high school graduation which wasn’t all that long ago, but now seems like something that was in another lifetime. I started to think about all the interesting things I have accomplished since I graduated. Knowing that I studied in Spain, and then moved there since I’ve finished high school, it only makes me feel so excited for these kids to get to explore the world and have similar experiences as I did. After the ceremony everyone, parents, students, teachers alike, all went to the school where they had prepared a large piscolabis, or tables full of sandwiches, pizza, Spanish jamon (can’t have a Spanish party without a pata de jamon), and even sangria and beer! 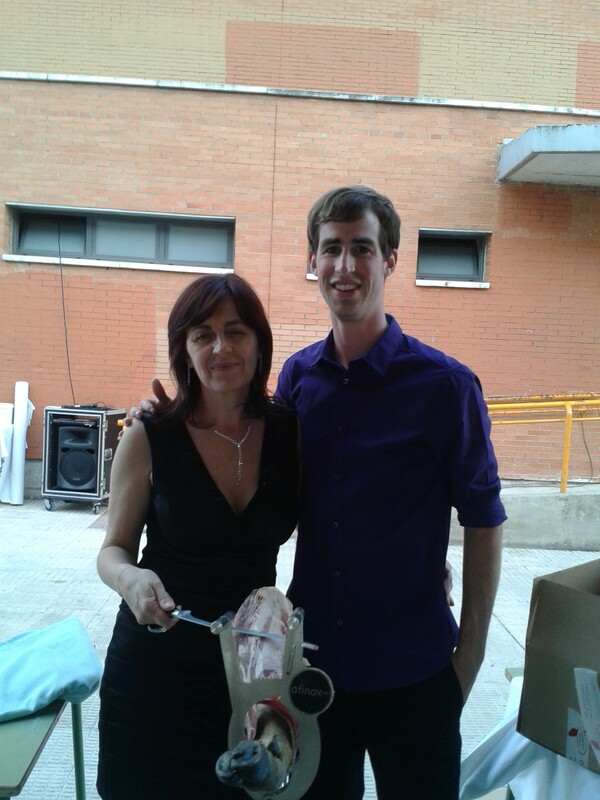 This is Maite and I cutting the jamon leg! Coolest teacher in the world. It’s quite unfortunate to say, but there I really got to know my students. We finally had the barrier of teacher-student broken and I was able to speak to them in English or Spanish which I was unable to do so during the year. All the kids kept telling me, “No more English, we’re out of class. Speak to us in Spanish.” So I did, even though these kids all spoke such wonderful English. I asked everyone (or almost everyone) what they plan to do for the future. Most are going to college. Others are studying in other countries. But this all makes me really sad at the same time, that it took me so long to really connect with these students. They are all such great kids, and all have such fascinating stories and I was finally able to get to know the kids on a really individual level only at the very end. After the piscolabis, everyone went out! Even some of the teachers tagged along, including Maite, who is a teacher I wish I had had in high school. She’s really wonderful and the children adore her. The students had rented out a venue for the night so everyone was heading there. First, we had to do as the Spanish do: botellón. 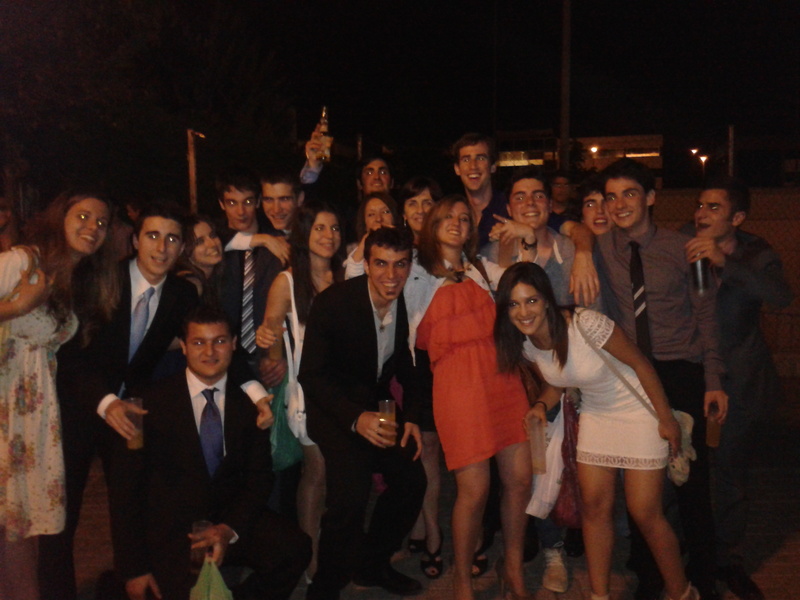 Everyone, and I mean everyone was drinking in the streets. It was a riot! I did rounds, chatting to everyone, getting to know them. A part of me felt like I was graduating too, it was all just so exciting and I’m not sure why I felt this way. Eventually we made our way to the bar and everyone was dancing. What a blast! We were there until about 6 in the morning when I had to catch my train back home to sleep. I was accompanied by a large caravan of students. We all said goodbye, and I took the hour long journey home. Once I got home, I slept for a short hour and a half, woke up to complete a presentation I had for that day, and then as I was entering the metro, I received a phone call telling me not to come in today. Thank god, I thought. I was still pretty groggy from the night before, feeling extremely hung over, and possibly a bit drunk still. But regardless, totally worth it. I’m sure all the other teachers wished they were teaching assistants so they could stay home. 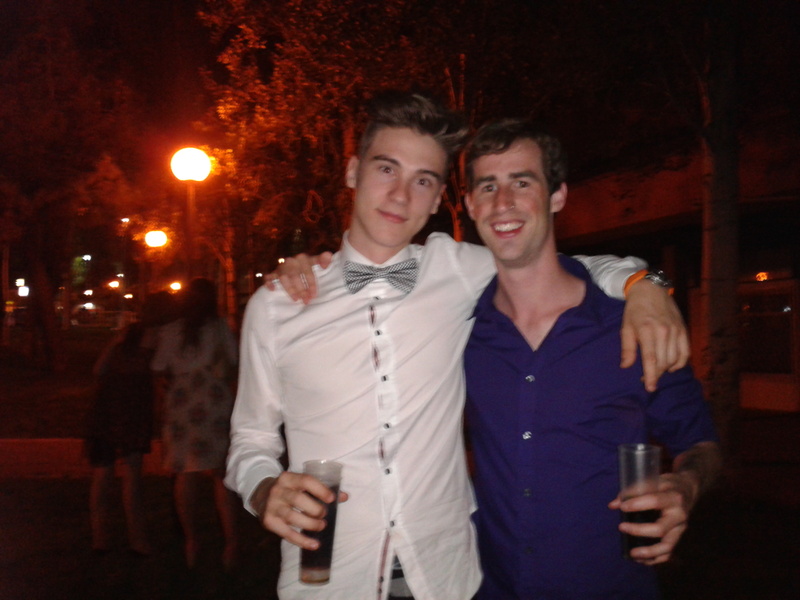 Anyway, that was my Spanish graduation and as strange as it may sound, it was easily one of the most fun nights I’ve had living in Spain. I know I’m going to miss teaching in Madrid next year. I’m already feeling nostalgic about all of it. But in last words, good luck to all those students. I know they all are going to accomplish amazing things. I miss my high schoolers all the time for this reason. I still talk to many of them frequently, and in English, and think the kind of relationship assistants are afforded with them is truly special.